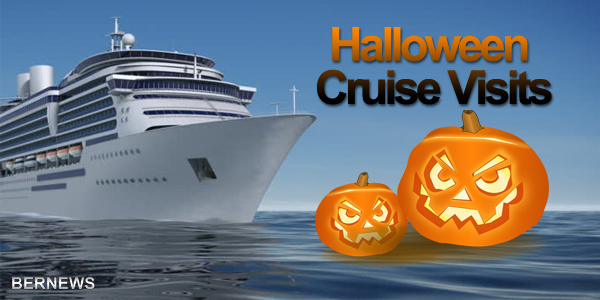 The island is set to have a number of extra trick or treaters on Halloween, with some six cruise ships scheduled to visit — set to berth in Dockyard, St George’s, Hamilton and at anchor– with all six ships combined estimated to be carrying over 18,000 passengers and crew. The Carnival Conquest, Hamburg, AIDAluna, Disney Magic, Azamara Journey, and Norwegian Escape are all set to visit, making for the unusual occurrence of the island scheduled to host six ships at one time. The Carnival Conquest is set to call, marking its only visit for the year, with around 4,300 estimated passengers and crew, while the Hamburg is also set to make her only call to Bermuda this year on that date, carrying an estimated 700 passengers and crew. The AIDAluna is scheduled to make one of her four visits with some 3,000 estimated passengers and crew, while the Disney Magic is also scheduled to be here with an estimated 3,300 passengers and crew. The Azamara Journey is scheduled to make her sole visit for the year on the date, with approximately 1,000 passengers and crew, while the Norwegian Escape, a regular caller to the island, is also set to be here with an estimated 6,000 passengers and crew members. The three bigger ships — Carnival Conquest, Disney Magic, Norwegian Escape — are set to berth in Dockyard, while the Azamara Journey will be in Hamilton, the Hamburg will be in St George’s, and AIDAluna will be anchored. In announcing this year’s cruise schedule late last year, officials said that cruise calls were projected to rise 12%, with Bermuda expected to receive 180 cruise ship calls, which is 19 more cruise ship calls when compared with 2017. Given the current governments anti foreigner Bermudians first position it does make for a pretty scary place! Enjoy feeling like you are not welcome! And no buses, way to go PLP. and thanks to the voters! Hopefully buses will be a top priority for the Government over this period. there have been thirty to fifty people waiting for the bus to Dockyard. When the bus finally comes it is full of locals going home from work. This is just unacceptable. Come on Bermuda. Like it or not, when you take into account that cruise lines book their schedules two years in advance, this has to be yet another thank you to the OBA. Hopefully in two years from now we will see a similar increase. Doubt it, prepare for the downward spiral now. Not such a big deal. One does not arrive until 1pm and the other at 430pm. after Labour Day all you get on cruise ships is newly weds and nearly deads. Newly weds don’t leave the cabin and nearly deads don’t leave the ship. In other words most stay on the ship. Had our nights is done. Don’t forget to mention that we can expect many rental cycle accidents and traffic delays. Even more so if the buses aren’t running. I just hope none of them go home in body bags.